All transactions are safe and secure with a reliable history in online purchasing behind each of our associates. Buy the Got Milkshake t-shirt to own There Will Be Blood clothing and merchandise. At this point, you may be wondering what the Daniel Day-Lewis There Will Be Blood quote actually means. Director Paul Thomas Anderson took the catchphrase from a transcript of New Mexico Senator Albert Fall speaking at the 1924 congressional hearings on the Teapot Dome oil-drilling scandal. Senator Fall used the term "milkshake" to explain the complicated technical process of oil drainage to the senators. 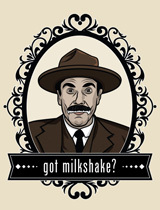 The I Drink Your Milkshake shirt on the left features a portrait of Daniel Day-Lewis as Daniel Plainview with a milk mustache. In addition to the Got Milkshake tee above, browse the There Will Be Blood Clothing Gallery for more apparel like men's and women's clothes, kids shirts or hoodies.